Loudness jumps between program items is a well known phenomenon for broadcasters and producers of multi-media or game audio. Only levelling by ear could fix this, a tedious task especially when content is collected from more than one source. International demand for a loudness measurement standard has led to the ITU LKFS/LUFS loudness descriptor. The core team of LevelOne was at the forefront of this standard and actively helped the EBU to create the R128 broadcast loudness recommendation. LevelOne now solves loudness problems for you with automatic compliance to the EBU R128 recommendation or the ATSC A/85 and Calm Act specifications. With its smart preset based interface and unlimited batch file processing, LevelOne v2 will improve your post production speed dramatically. It performs all your level normalisation tasks automatically and accurately. You have the choice of normalizing to and monitor ITU/EBU LUFS loudness target levels, Dolby Dialog Intelligence levels, sample or true (over-sampled) peak or PPM peak. Including the readout of max M (max Momentary), max S (max Short-term), LRA (Loudness Range) and PLR (Peak to Loudness Ratio). LevelOne will warn you when a file exceeds user defined maximum levels after normalisation. Normalise files to comply to ATSC A/85 including dialog detection. Normalise files to comply to the EBU R128 with a single drop of the file. True Peak Limiting for fully automated normalisation. Hotfolders automatically analyse and/or process files when added to a folder. Stand alone FFmpeg compatibility for optional loudness correction of many more file formats, such as video files. Added with a few clicks. Use console commands to add and process files though scripting. Create preset specific droplets to drop files on for your desktop. Lossless adjustment of MPEG2 and 3 files to preserve the quality of the audio. Easy readout of file details and all loudness descriptors. Export CSV files with loudness values. Add BWF v2 data to wave files including its loudness values. 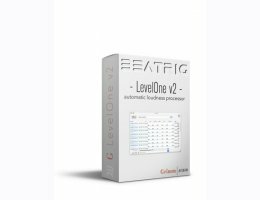 Download the LevelOne demo version here!